Are you eager to see the annual Perseids on Thursday night? You’ll have to wait until after 10:00 p.m. local time to see them, so why not pass the time until showtime by viewing the planets right from your doorstep? Step outside for the planetary warm-up act. All you have to do is look towards the west as soon as the sun sets. Bright Venus is the first to appear. It’s really bright, and you can’t miss it! Now, hold your clenched fist up to the sky covering Venus. To the right of Venus, about 1/2 of a clenched fist away is a second planet. That’s Saturn. And to the upper left of Venus is another planet… That’s Mars. But wait, there’s more! Look below Venus for the slender crescent moon. If you don’t see the moon, look again Friday night – it will be a larger crescent to the left of Venus a day later. Though the three planets appear together in our line-of-sight they are really far apart from each other and from us on Earth. Mars is about 300 million km (186 million miles) from Earth, while Venus is 112 million km/70 million miles distant. Saturn? It’s 1,535 million km/954 million miles from Earth right now. The moon? 363 thousand km, or only 225 thousand miles away. It’s fun to compare the size of the moon and Mars, especially if you received that annual email (which incorrectly) states that Mars will be as big as the moon this month. Do the math. It’s impossible! The Solar System Simulator is a great public resource for geeks. You can see any planet or spacecraft from any vantage point on any date you select. 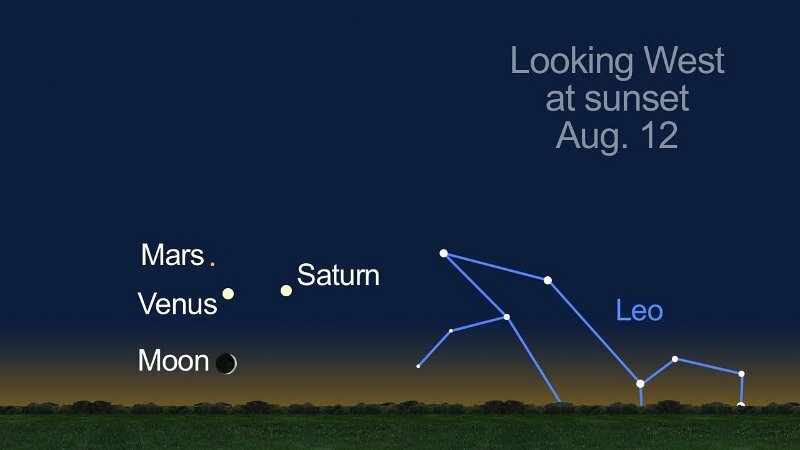 I picked August 12th to show the view of the planets and moon from Earth. I hope you can sense the three-dimensional orbits of nearby Venus, far-away Mars and distant Saturn. Have some fun with it! Every day the Cassini Mission website shows a view of Saturn from Earth, from Cassini, and right now Enceladus, as we close in on a flyby of that exciting moon later this week. 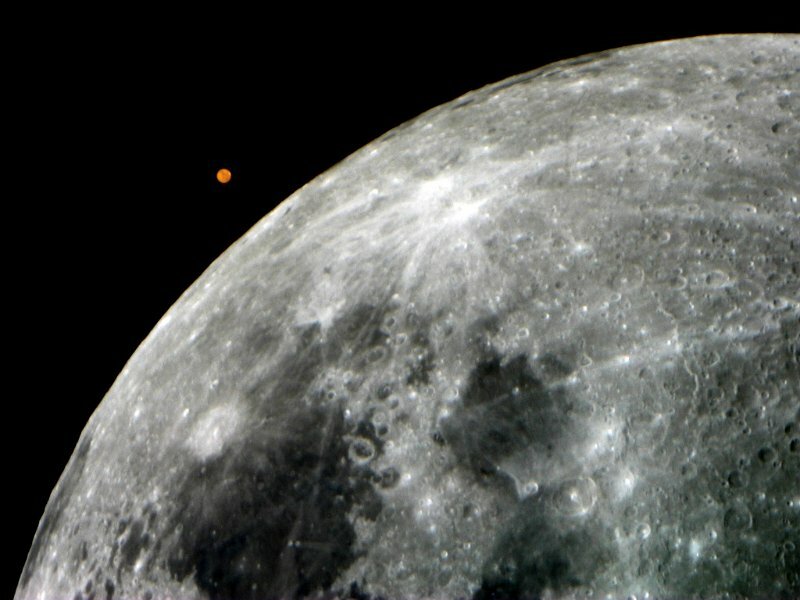 Jim’s image shows the apparent size of the moon and Mars really nicely! If he took the same image this month, Mars would appear super tiny! In the 2005 image Mars was about 50 million miles from Earth, and today it is 186 million miles away. The final image shows the trio of planets imaged Saturday night August 7th by my hubby, Morris (aka Mojo) Jones. 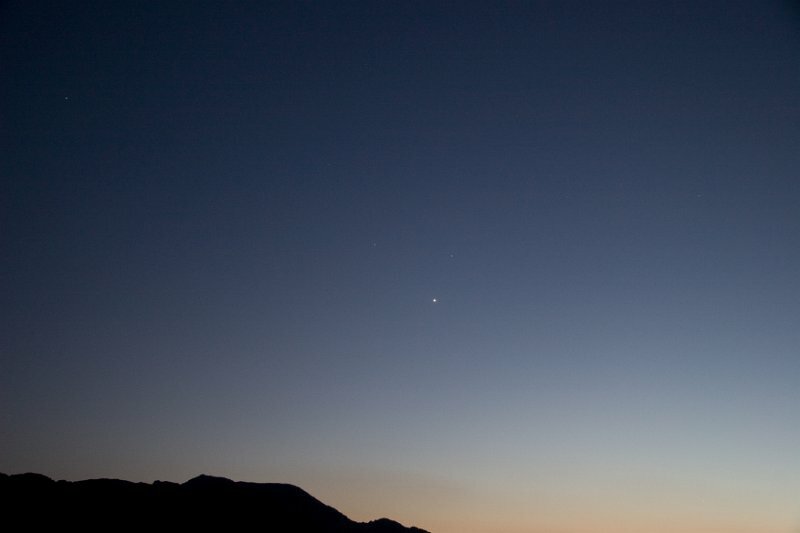 Click on the image to see the two fainter planets above Venus. He posted several images in his blog post called Sky full of planets and lightning. It’s really worth a read! The lightning was amazing Saturday night! I hope this little planetary warm up act will whet your appetite for more sky watching this week. The Perseids will be a real spectacle, especially if you can get away from the city lights. I’ve pretty much decided to head out to the Mojave desert and see the star show from Amboy Crater. Clear Skies everyone, and happy solar system observing to you all! California Clear Sky Chart Black dots indicate the darkest observing areas. Amboy Crater, on the southern border of Mojave National Preserve is the closest “black dot” dark observing area and will require a drive of over 200 miles for Thursday’s Perseids. 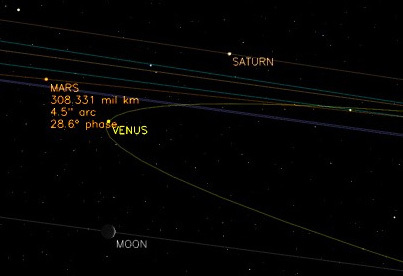 NASA’s Solar System Simulator Check out where the Voyagers are right now! My Mars in August website, updated each year since 2005.